Regular Love vs Psychic Love? So, this is a first. We’ve had our share of Christian proselytizers of various denominations around these parts, but never an advert for our local psychic. Found this flier hanging on my door this afternoon. Our yard is a bit of a mess, so I suppose it’s fine to assume that our spirits, loves, and auras could use a good once-over too, perhaps. 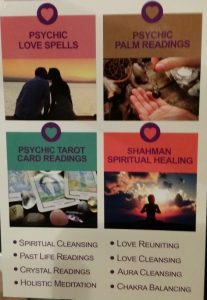 Maybe I’m being a bit pedantic here, but I think if I were going in for love spells, I’d like my intended target not to be psychic. A bit of mystery keeps the magic in the relationship, right?